These "Firefly" IR lights are designed to snap onto a standard 9 Volt battery. They have a single steady IR light. The LED is aimed along the long axis of the battery so illuminates the sky if the battery is standing up. The Budd Light 5855-01-361-8987 invented by Henry C. "Budd" Croley is a flashing IR beacon. The IR LEDs are pointing at right angles to the battery long axis so if the battery is in a pocket some of the LEDs will be pointing out through the clothing which is transparent to IR. The Phoenix Jr. is virtually identical to the Phoenix Beacon described below. The primary difference between the two is that the Phoenix Jr. is a flashing-only beacon. The unit begins transmitting a pulsing signal (nominally 45 PPM) as soon as a battery is connected. The Near-IR signal can be seen only by those equipped with NVG and tests show that it can be seen at ranges out to 14 nautical miles. The Phoenix is a small, lightweight IR transmitter that operates in the Near-IR range. Its unique capability is the user-installed Morse Code-like signaling pulses that it transmits. 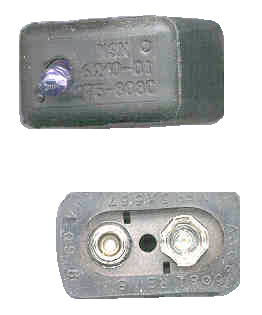 Using a tool as simple as a coin, a survivor can install a series of prebriefed identifying dots and dashes (code-of-the-day) that are uniquely identifiable by SAR/CSAR forces. The signal can be seen only by those equipped with night vision goggles; and tests show that the Phoenix signal can be seen at ranges out to 14 nautical miles. 100 hours on a 9 Volt battery. The user can use any metal object such as a coin or dog tag to store up to 20 seconds of morse code message. <>The Phoenix 2.5 (NSN 5855-01-451-9877) is an upgraded version of the Phoenix Combat Identification Beacon. The Phoenix 2.5 has a two-channel signaling capability. Channel 1 is the default code; however, the user can install up to 20 seconds of pre-briefed code into Channel 2 using any metallic object. The Command Entered Recognition Encoder (CERE-25, NSN 5855-01-452-0079) is necessary to install the semi-permanent code into Channel 1 of the beacon. This is the time this page has been accessed since since 13 Feb 2002.